Welcome to the W&L QSN Chapter Page! 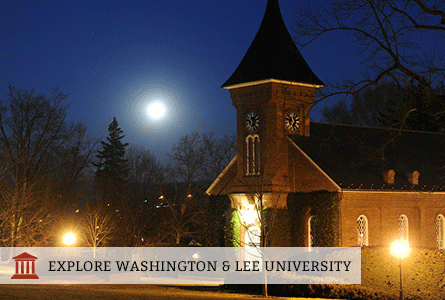 W&L is a small, liberal arts university which provides students not only with incredible academics, but also network connections and important skills to succeed after graduation. The mission of our chapter is to provide a smooth transition for scholars into their first college year and to continue to support them through our programming. We aim to engage scholars in social activities by organizing monthly events, which include our annual induction ceremony, cookouts, theme dinners, and dessert discussions. Our Community Service Chair sets up monthly opportunities to volunteer on campus and in the greater Lexington community. We have a great relationship with our admissions team and have had great success collaborating with them on our annual National Quest Day event. Admissions at W&L is very welcoming and is an amazing resource for our Scholars. We have participated in calling and meeting with potential QuestBridge students and assisting admissions with various visit programs. On campus, we also collaborate with the Career Center and deans in order to provide support and advice for Scholars throughout their college years. Throughout the year our chapter offers many opportunities to Scholars including service projects, Quest Mentoring, and workshops on topics including career development, financial assistance, and low-income/first-generation support. Some of our most successful events include our annual QuestBridge Kickoff, which is usually a casual cookout, Thanksgiving Dinner (QuestGiving), and Accepted Students Day. The Thanksgiving Dinner is sponsored by our chapter for all students who stay on campus during Thanksgiving break. The chapter especially enjoys Accepted Students Day because we so excited to welcome the new scholars and give them a peek at what life at W&L is like! Our Scholars have also enjoyed some of our new events, which include our Induction Ceremony, Halloween Costume Party/Contest, Exam Week Pizza Break and Carter Mountain Trip. We are very happy to be a part of our chapter and are very excited to welcome new Scholars every year!